This dress was made for "staring into gorgeous scenery photos", was it not? 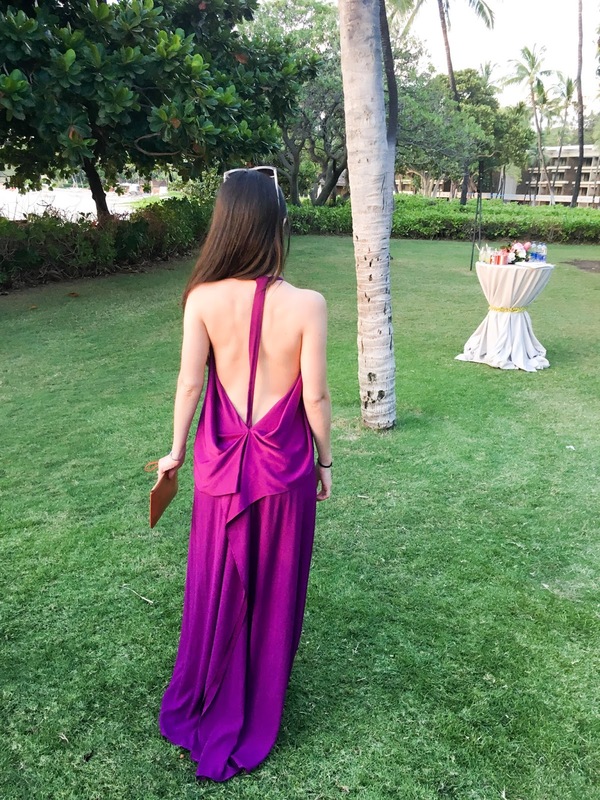 The open back is basically the reason I bought this dress, which I purchased (not rented) from Rent the Runway. They used to hold an insane sample sale (think long lines and very aggressive attendees) that I would try to visit when I lived in NY, but they have since started selling dresses that they don't rent out anymore, online. 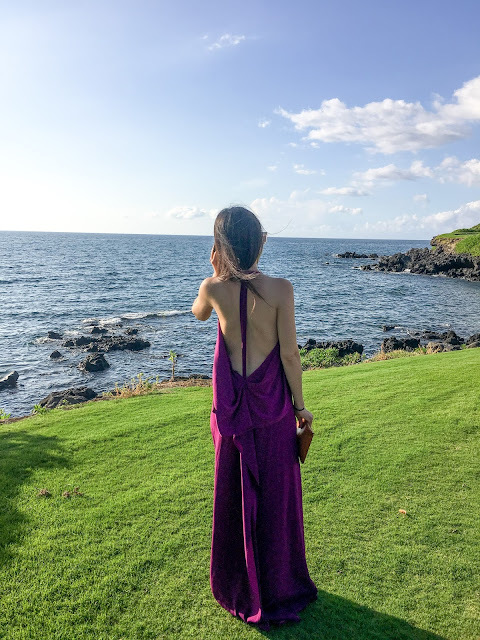 The pricing for the items they sell varies, to be honest, but I was pleased with the markdown on this dress, which ended up being a little over 75% off of its retail price. When I found it, the only dress left was a couple sizes too large, but in looking at the reviewer's photos on the RtR website, I didn't think it would make that much of a difference, since the fit is very drapey and loose. Turns out I was right, it looks like most of the size difference is reflected in a change in the length of the dress, and I knew I'd need to get the dress hemmed no matter what. I paired the dress with turquoise jewelry for some color contrast (you can sort of see the earrings in the photo below), a Mansur Gavriel clutch, and my favorite any-day-all-day accessory: a hair tie. 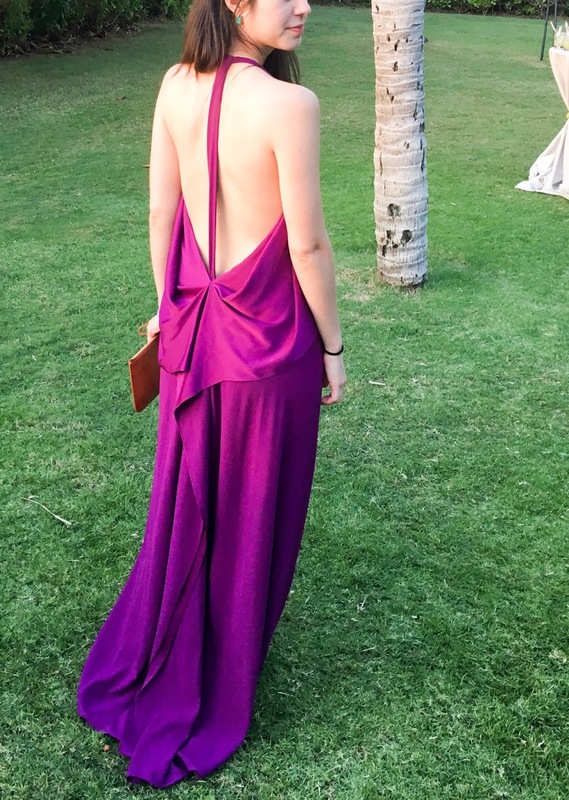 This dress has made me think I should look into purchasing more plum-colored items. I also love that the dress very flatteringly makes me look taller. I'm 5'2'' and am wearing flat sandals in this picture, but I feel pretty statuesque (it probably helps there is no one else in these photos, for scale ☺).